This bottle of antacids is yours for a mere EUR6.25 in Amsterdam. That's US$8.63 for purposes of comparison. Now, knowing that it could be had for, let's say, a third of that price in the U.S. is somewhat galling. 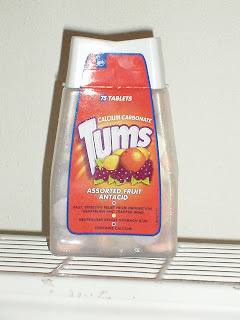 On the other hand, a single Tum (plural is Tums, right?) can mean the difference between a night of no sleep and a night of good sleep for me, so at US$0.08 per visit from Morpheus, you'd have to say it's quite reasonable. Apart from pointing out that there's an opportunity for a clever importer to strike it rich here, the larger issue I want to raise is the double standard you find in the Netherlands about drugs. Many's the time I've been walking down the street at any time of the day or night and heard the words "Psst! Coke, Speed, Ecstasy?" murmured at me from a shady character. And who among us can honestly say they haven't been out there on the corner themselves hustling crack when money was tight? But try to extract even Tylenol (or paracetamol, as it's known here) from anywhere but a drugstore here and you are out of luck. If the store is open, you can pick up 10 pills for EUR2.50 (US$3.45), and you can't buy more than that in one go. Wouldn't want a lot of Tylenol addicts on our hands, would we? Would you perhaps care to have the option of employing painkillers while giving birth? If you haven't arranged it ahead of time, nothing short of a C-section while pry them from a doctor's fingers in the heat of the moment. As a final anecdote, I recently went to the dentist for the first time in six years (it's a real pain in the beautocks trying to figure out the health system here as a furriner) and I had to have two fillings. The dentist asks me whether I want Novocaine. "What's the alternative," says I. "Not having Novocaine." says he. Ah. That would be a "yes," then.